Business Liability Insurance Options--Delaney Insurance Agency, Inc. While on the job, you accidentally damage a customer's property and the repairs are costly. Should a claim like one of these be made against your business, then your commercial general liability insurance policy may help pay for the damages. Bodily injury or property damage—Helps protect against certain claims businesses for claims alleging financial loss due to property damage or bodily injury arising out of your business operations or products. Reputational harm—Helps protect against certain claims of false arrest, malicious prosecution, libel, slander, wrongful eviction, violation of the right of privacy and more. Advertising errors—Helps protect against certain claims your business if others claim you infringed on their copyrights when advertising goods, products, or services in your advertisement. Medical payments—Helps protect against certain claims medical costs if someone is injured on business premises and needs medical treatment. Damage to premises rented to you—Helps protect against certain claims businesses for damage to premises rented to you due to fire, lightning or explosion. Extending Your Coverage—If a contract requires a business to add individuals/entities to its business liability insurance coverage, The Hartford helps make it easy to add them to the policy. Improve Safety and Reduce Risk—One of the best ways to avoid a lawsuit is to run the safest business possible. The Delaney Insurance Risk Management Team can help with one-on-one risk management consultations and safety seminars. They can also find ways to save companies money with discounts for things like installing safety equipment and following best practices. For "higher hazard" liability exposures, our General Liability Team is experienced in hard-to place and unique products and premises risks. We offer solutions for manufacturers, wholesaler-distributors and importers of difficult-to-place products, as well as others with unique or difficult General Liability exposures. 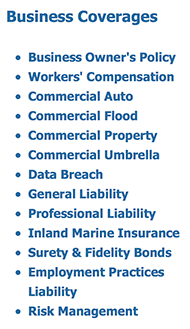 Stand-alone or bundled with other solutions, our General Liability coverage and services are designed to provide a total solution. Our coverage helps protect against third party injuries and associated defense costs in addition to other high hazard exposures. That's why having general liability protection from Delaney Insurance Agency, Inc. is critical. Ready for a quote? Learn more about how you can tailor your business insurance.